There more additions to my Great Rebellion Collection, featuring the virtuous characters of the She-Ra: Princess of Power Universe. RedBubble has offered even more products to print these images on, so while you can find these illustrations on t-shirts, hoodies, leggings, pencil skirts, scarves, kids'/baby's clothes, stickers, prints, posters, postcards, greeting cards, pillows, totes, drawstring bags, studio pouches, mugs, duvets, iPad/iPhone/Samsung Galaxy/laptop cases and skins, spiral notebooks, and hardcover journals, you can also find all of the other previous illustrations from this collection available on those products as well. In fact, much of my work is available on most of these formats at my RedBubble.com store. "Rebels: Credited and Wave 1 Plus" by Kevenn T. Smith. Click on the above image to buy products with this illustration. This image features all of the characters on the She-Ra cartoon's opening credits sequence, and all the characters from the first wave of the vintage toyline. 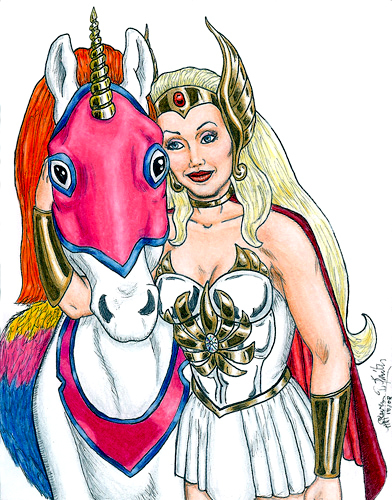 Star Wind: "Valkyrie's Companion Mare" by Kevenn T. Smith. Click on the above image to buy products with this illustration. Star Wind is a combination of her Filmation design and the first toy Swift Wind. Spritina: "The Sweet Little Wood Sprite" by Kevenn T. Smith. Click on the above image to buy products with this illustration. The first of the Twiggets in this series, Spritina was the only one featured in the cartoon's opening sequence. Peekablue: "The Beplumed Oracle" by Kevenn T. Smith. Click on the above image to buy products with this illustration. Snout Spout: "The Unsinkable Elephantine Firefighter" by Kevenn T. Smith. Click on the above image to buy products with this illustration. Perfuma: "The Scentsational Floral Nymph" by Kevenn T. Smith. Click on the above image to buy products with this illustration. I did this piece for the Illumina Day fan project in support of awareness of the character of Illumina for the Masters of the Universe Classics toy line, of which I'm a big fan of. Illumina was a character created by Val Staples and Emiliano Santalucia and slated to appear in MV Creations' 200x era He-Man and the Masters of the Universe comic book, and even appeared in print in an in-house ad, before things behind the scenes prevented her appearance. Illumina was going to be a heroic Gar warrior, also gifted with powers of light, who was trapped on the Dark Hemisphere when the Mystic Wall went up, keeping Skeletor locked away for years. Many fans hope she will win the upcoming fan choice contest from Mattel and will receive a figure in the MOTU Classics line. I listened to a lot of holiday music as I was making this piece, and I get a Holiday feeling from it. Since Illumina can light up the dark, I thought a lot about the Winter Solstice, and how it's the longest period of darkness in the year. 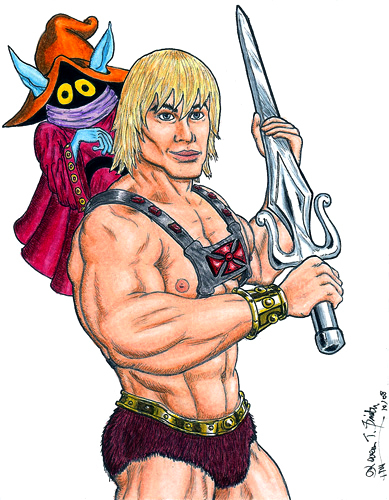 I'm sure Eternia has its own version of the Winter Solstice, with a longest night of the year. Illumina, herself, spent many years confined to the dark half of Eternia with precious little light. I feel like there's a sense of hope in this piece that accompanies the Winter Solstice. A hope for a brighter tomorrow. This second entry in my Singular Sensation series is of a character drawn for the cover of Oziana #37. I simply call him "Pig Guard." I got a request to draw characters that appeared in stories in the issue, but I didn't always have access to the actual stories. In some cases, all I got was copies of artwork being used to illustrate the stories. In this case, all I had was an illustration to go on, but one that really captured my imagination. I am a big fan of the work that The Four Horsemen studio did on updating Mattel's Masters of the Universe property for the 2002 line. The amount of detail they put into each of the character re-designs continues to impress me. When I saw the illustration of this "Pig Guard" character, I thought it would be a really fun idea to give him that same kind of approach. I wanted to put more detail into his look and to introduce a more aggressive and physical element to the entire wrap-around cover piece. In the cover piece, the Pig Guard was going to be fighting on the same side as Bastinda, the Russian version of the Wicked Witch of the West. I thought it would be a nice homage to the Winkie Soldiers in the MGM musical movie version of The Wizard of Oz if I made the Pig Guard's skin green. However, when I thought about that, I worried that some people would think that I was trying to rip off the Gammorean Guards in the palace of Jabba the Hutt in Return of the Jedi. So that idea was nixed. I still wanted to make the Pig Guard look more otherwordly, instead of a pink, tan, or brown skin tones that one usually found on a pig. That's when I hit upon the idea to make the skin tone a nice "decayed blue." It really worked too! I thought I was being so original, until a friend pointed out that Gannon, the Big Boss in The Legend of Zelda game for Nintendo, was a big blue pig. It's true, there really is nothing entirely new! 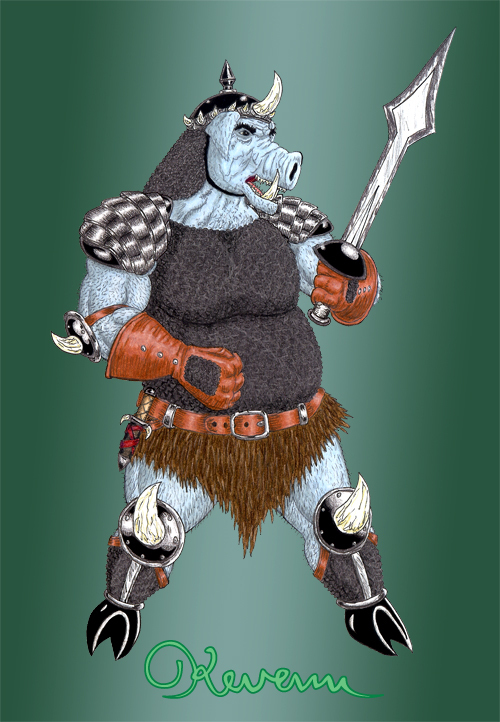 I haven't played that game in years, but from what I remember of the character, I think I made this Pig Guard look significantly different. Pencils, Ink, Prismacolor Color Pencils, Photoshop, and Adobe Illustrator. I sold the He-Man and She-Ra artcards and colored them before I sent them off. I wanted to post them here to be able to compare to the inked versions. This artcard is now available as cards, postcards, and small matted prints at RedBubble.com!